As a woodworker, hobbyists or DIYer there are certain things that you must have in the workshop or garage to help with different projects. While many will put a lot of emphasis on power tools, a workbench is still as important as the tools as you will use it for almost all your projects. And portable workbenches are even much better as you can fold them quickly and move them from one job site to the other with ease. As their name suggests, these are just ordinary woodworking workbenches that are lighter, smaller (in most instances) and foldable (mostly) for easy portability. Portable workbenches are handy when you need to cut, sand or clamp a workpiece but they can also provide a work area for crafts and many other tasks. As handy as portable workbenches might be it is not always easy to choose the best one for your workshop from the many options in the market. But, the workbenches will differ in everything from their size, material, weight, and capacity. And so understanding the different features should make it easy to pick the right one for your projects. The Black & Decker WM125 is the cheapest and lightest bench on our portable workbench reviews. And it will be a great addition to the workshop as it is also quite versatile. Despite the affordable price tag, this is still one of the best portable workbenches out there as you can quickly fold and move it from one job site to the other. It folds flats to make storage and carrying easy. This workbench features a durable steel frame that provides the strength that you need to support weighty workpieces. Once you set it up, it will not give in no matter how hard you pound it when cutting or sanding. The adjustable swivel pegs on the WM125 are also a great addition to the tool as they make it easy to clamp your irregularly shaped object and hence increasing the versatility of the workbench. Also, the jaws on the workbench will resist warping, and you can use them to accommodate workpieces with unique shapes. What this means is that there is almost nothing that you cannot clamp on this table. Worx WX051 provides a work area of up to 725 square inches. This model is also very versatile as the table can convert into a sawhorse in seconds. The workbench is ready to use straight from the box with minimal to no assembly required. And it comes in a compact, lightweight and foldable design that makes it easy to carry from one worksite to the other. When using it as a worktable, it can support up to 300 pounds of materials and up to an impressive 1,000 pounds when using it a sawhorse which is one of the highest capacity on our reviews. This portable workbench will also connect to others to make it easy to expand your work surface when dealing with extensive materials. The manufacturer also supplies the joiners that you need for this. Securing materials on this workbench should also be quick and easy as it will come with a couple of quick clamps and 4 clamp dogs. Also, the legs will lock to provide added security. Woodworkers on the hunt for a portable workbench that provides a massive work area will love the WM1000 model by Black & Decker. It is one of the best folding workbenches in the market thanks to the heavy-gauge steel frame that will not only last for a long time but is also sturdy enough to hold up to 550 pounds. This sturdy workbench is also easy to carry around and free standing to provide a convenient workspace. And the work area is high-quality bamboo that will last for a long time. The quick folding design mechanism makes it easy to fold, and it should only take a few seconds. And to make things even better the workbench also features a one-handed clamp design that makes it possible to adjust the clamps both individually and together. For clamping, you get 4 adjustable swivel pegs that will make it easy to clamp even the workpieces with irregular shapes. The only significant shortcoming is that the bolts that screw down the bamboo top section to the frame will screw into plastic and so the connections are not very long lasting. You can always trust Black & Decker to have a top-notch workbench for you regardless of your particular needs. Their WM225 is ideal for a woodworker looking for something versatile and convertible. The workbench can convert or transform into a vise, sawhorse and even a bench tool stand which makes it very useful in the workshop. Like most portable workbenches from Black & Decker, it comes with a durable steel frame that gives it the ability to hold up to 450 pounds. And there is also an easy-to-use clutch and clamp mechanism. This clamp system includes 4 adjustable swivel pegs that will make it easy to clamp irregularly shaped workpieces. There are also some adjustable rear jaws that will give woodworkers flexibility and some extended range of use. With the dual-height adjustable legs, a woodworker gets the freedom to adjust the height to make the bench more comfortable to use or fold the legs under when working with extensive materials. This lightweight and portable workbench is easy to fold for storage and transportation. But, the lighter base can also be a shortcoming when it comes to keeping the workbench sturdy. With the relatively large work area and weight capacity (up to 700 pounds), this Keter folding workbench will be perfect for most of your projects both in the workshop and outside. But, its quick opening system is one of the things that set it apart from many others on our reviews and in the market. This system makes it possible to set-up the bench in just 30 seconds and 3 simple steps. The convenient foldaway design is also a great feature because you can fold the workbench quickly. And this allows for effortless storage and convenient transportation between worksites. There is also a sturdy carry handle to help with the portability. The polypropylene resin construction and aluminum legs combine to make this a relatively long-lasting workbench, and it should last long enough for the price. And despite the compact size, this workbench has a maximum weight capacity of up to 700 pounds. This workbench will come with two adjustable holding clamps to help keep your materials in place. Also, you can extend the aluminum legs by up to 4 inches to get a better angle of the workpiece. Here is another excellent folding and portable workbench by Keter. Its most outstanding features are that it provides a large work area and also withstand up to 1,000 pounds. Like most of the other high-performing Keter workbench model, it also uses their unique opening system that makes it possible to set-up the bench in less than 30 seconds. And closing it is equally quick and easy. This portable workstation is made from weather resistant materials that include a plastic base and some steel legs. These materials will not fade under the sun, peel or rust and this makes this a highly durable workbench. The folding work table will also work well as sawhorse and is also handy for holding boards when painting and its couple of one-handed clamps will keep your workpiece in place when sanding or cutting. And if you compare this model with others on our portable workbench reviews it is also relatively affordable, and so you get a high-quality table without spending a fortune. The Kreg KWS1000 might be the priciest workbench on our list but it worth it as it not only offers a large work area but it also has a high-quality construction. And besides from getting a large work area the design of this Kreg bench also offers 360-degree access to the workpiece to make it even more convenient. The hole patterns on the table will accept bench dogs from Kreg and many other brands and also other accessories. And there are also built-in that will hold accessories and other parts. You will never have to worry about the sturdiness of this worktable or wobbling when working on a weighty workpiece because the heavy-gauge steel legs provide a solid foundation. With the Kreg KWS1000, you can also get a big work area as it is expandable by joining it with other mobile work centers. When you buy the workbench, you will get 4 bench dogs, and it also includes an auto-adjust bench clamp. This work table will fold and unfold in seconds to make it simple and convenient to store and transport and set-up in different worksites. A portable workbench is an excellent addition to your workshop, and it is one of the things that you will have to use for almost all projects. And so it is vital to make sure that you get the best. Luckily, there are a lot of portable workbenches in the market, and all you need to do is know how to pick the best between them. Also, this should not be a problem as you only need to keep the following points in mind when shopping. The size of the table's top is what determines the work area that the portable workbench will provide, and so it should always be one of the first points to consider. When it comes to the top size, the right idea is to match it with the tasks or projects that you often do. If you only need a workbench for making a few precision cuts, a small one would be okay. But if you need one to fix drawers or assemble a large frame then the more extensive the work area, the better. 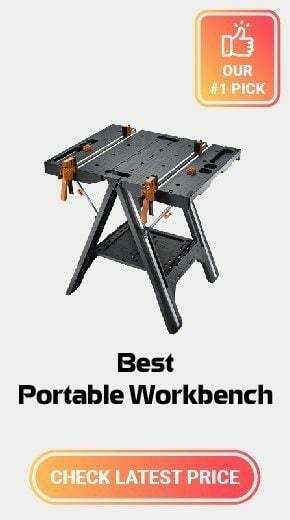 Also, note that in most cases the portable workbenches with a large work area also tend to be the priciest. And so your budget will also determine the size that you get. When it comes to the bench weight, there are two crucial aspects that you will need to consider. The first one is the weight of the workbench as it determines the portability. Secondly, you also need to take into account the weight capacity or the maximum load that it can handle. A workbench that is too weighty will not be easy to carry around from one job site to the other even if it folds down to a compact size. But, also note that the super light, portable workbenches are made from plastic and other light materials, and so they have a lower weight capacity, and they cannot handle tougher jobs. And so it is essential to strike a perfect balance between the weight of the workbench, portability and weight capacity. Every minute counts when working on an important project or when dealing with strict deadlines. Hence you do not want to spend a lot of time trying to assemble a workbench. A good workbench should not only be straightforward to assemble but should also come with directions and tools (if necessary) for the assembly. Some will not even require any assembly as they are ready to use straight from the box which can be a very convenient feature. Whether you are sanding or even cutting your workpiece on the portable workbench, you will need to clamp it down. The best workbenches are those that come with some clamps as they eliminate the need to use external ones and can also help to speed up your tasks. But, also check the quality of the clamps and ensure that they are easy to adjust, secure enough and that their size suits most of your projects. Your portable workbench should be stable enough to work on once you set it up. Stability makes tasks like sanding or cutting easier to achieve and also makes the table safe to use. If you have been scouting for a portable work table, then you have most probably encountered the Black & Decker Workmate and Keter Folding Work Table. Those 2 models are the most popular around and for good reasons. They both offer their particular forte and lacunas. Here is a rundown/comparison of this two popular models. You do not want to spend hours mounting a portable workbench. It should be foldable in a matter of minutes, and preferentially deployed within seconds. On this scope, Keter is the clear winner. Their workbenches can be deployed in a matter of seconds, with no assembly whatsoever. On the other hand, Workmate is hard to deploy requiring tools and comes with cryptic instructions that are sometimes intelligible. If you have never worked with a portable workbench before, Workmate will test your patience to the moon and back. We cannot talk about portable workbenches without portability. Both the Workmate and Keter are light and portable workbenches. They are compact and discreet and best, when not in use, they can be tucked away or hanged requiring minimum space. However, Keter earns a winner point for portability despite it being a little heavier than the Workmate. The compact uni-body design of the Keter means that it can be carried anywhere like a regular case and deployed or folded down almost instantly. The vice (clamp) is a nice addition to both those models. They are easy to use and hold materials nice and snug. A major difference is where Workmate uses plastic inserts while Keter uses metal ones. The vice of the Keter feel more solid than that of the workmate, despite it having greater clamping force on paper. Another point goes to Keter. Both models come at the industry standard height of 29”. They are both adjustable to a couple inches taller and it is quite easy to do so in both. Keter has only one-level height adjustment while Workmate offers at least a two-level height adjustment. Workmate wins in this situation. While both has a solid construction, the jury is out when comparing those two on construction. Generally, Keter uses an ABS plastic construction while the Workmate a steel one. You might think that steel wins here but think again. Some Keter models are made from resin and offer the lightweight-ness of plastic while providing the construction durability of metal. In terms of construction, it is a tie and the user will have to decide which construction material he/she prefers. Generally, the build construction along with the materials used dictates the stability of the unit. Both Workmate and Keter use a traditional 4-legged stand which makes them a tie. Workmate prefers a steel construction while Keter opts for resin. Both are excellent materials offering excellent stability. With resin being the more premium material, and also the more expensive one. On this feature, it is neither a lose nor a win for both. It simply depends on the user’s preference. Price is always at the heart of the conscientious buyer. While both products have their own set of features, advantages, and disadvantages, it is hard to beat the competitive price of the Black & Decker Workmate line of products. Workmate here wins hands down, despite its more simplistic design. Whether you are just learning the trade, are a hobbyist or an experienced woodworker, a portable workbench is a great purchase. And with our workbench reviews above you now have an idea of what to buy. Our buying tips above should make it easy to pick between these different workbenches. But, also remember to consider other factors such as the height of the table and the folded size to make sure that you get the best portable workbench. With our detailed guide above and reviews, all you need to do now is to go out and buy that workbench that you feel will add some value to your woodworking.